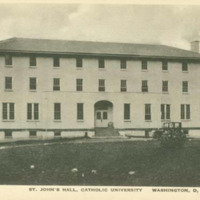 The National Catholic War Council (forerunner of the United States Catholic Conference) erected St. John's Hall in 1920 as a vocational training facility for a federally assisted Soldiers' Rehabilitation Camp. The War Council also held civics classes there as part of its Americanization campaign. The building reflected the style of community houses built by NCWC throughout the country. Staffed by Catholic University of America professors but administered by the Council, the camp provided training for illiterate wounded servicemen. 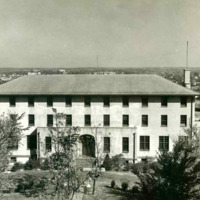 In July 1922 the University purchased the building and administered the program until it was discontinued in July 1923. At this time, the University had a shortage of on-campus housing which required some lay students to live off campus. To meet this need, St. John's Hall began to be used as a dormitory, a function that continued through the 1969-1970 school year. During this time, portions of the building were also used for educational and administrative functions. Ernest A. Valade, an instructor in the Catholic University of America Department of Electrical Engineering was also the first director of the Rehabilitation School and links between this department and the building continued for some years. The offices of the department were housed at St. John's from 1923-1961; lecture rooms were also used by the department until 1959. Offices and lecture halls served at various times the Departments of Journalism, Mathematics, Politics, Sociology, Architecture and Planning, Philosophy, Nursing Education, Social Science, the College of Arts and Sciences, and University College programs. After 1970 the building provided office space for University administration, support service offices, and student organizations, including The Tower, The Cardinal, the undergraduate student government and WWCU radio station. Where once foolish laughter reigned. Whilst he treads his eerie trail. When we hear his dreary wail.